Several murders went unsolved five years ago. The cold case unit of the Atlanta Police Department has reached out to newly-minted forensic psychologist, Dr. Addison Parker to unravel the mysteries that have baffled law enforcement for half a decade. The case of Marlon Jennings has been placed in Dr. Addison’s lap. It’s five years cold with no viable suspects. For fans of Deidra D. S. Green, the name Marlon Jennings rings a bell. He was one of the men murdered in the Woman at the Top of the Stairs series. If Dr. Parker is successful in resolving this crime, she will effectually unravel a bond of sisterhood of the women who took matters into their own hands and eliminated the men that made their lives a living hell. You know her from the Chloe Daniels Mystery Series but now, Dr. Addison Parker is standing on her own two feet. 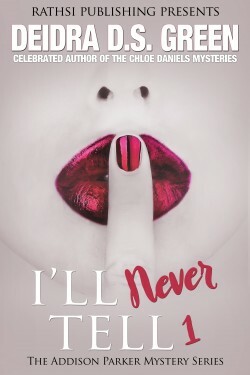 Find out if she has what it takes to solve her first cold case mystery in, I’ll Never Tell: The Addison Parker Mystery Series. These Books are linked by series title but are all Standalone titles and can be read in any order.